Focus on your accomplishments. Many job seekers make the mistake of using their resume to detail their job description, rather than their accomplishments. A hiring manager will only be viewing your resume for a few seconds before making a decision about you, so you need it to stand out. Instead of a generic job description, state an accomplishment that’s unique to you and quantify it with evidence and numbers. Highlighting specific achievements increases your marketability and sets you apart from the pack. Keep it simple & straightforward. 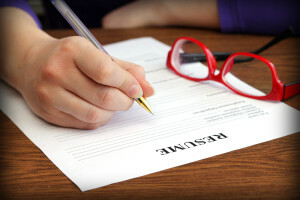 As previously described, a hiring manager will only be viewing your resume for a few seconds. So, you need to keep it simple and straightforward. You’ll have the opportunity to explain your qualifications and achievements in more detail during the interview, so keep your job descriptions brief. Limit it to one page, and use a clean, concise format and simple font, such as Calibri or Times New Roman, to make your resume easily readable. Don’t use the one-fits-all approach. Another common resume mistake is creating one resume and using it for all your job applications. More often than not, this will get your resume tossed in the trash. Instead, tailor your resume to the specific job and company to which you’re applying. Your resume should show how and why you’re a perfect fit for the position and organization. Proofread. Don’t rely on spell check to catch all grammatical and spelling errors. Always proofread your resume before submitting it, as incorrect grammar and spelling will ruin your chances at that job. It’s beneficial to have another set of eyes review your resume as well, in case you missed something. With these tips from Omar Yunes, you can create a killer resume that will help you land an interview. Omar Yunes of Sushi Itto was recently named the Best Franchisee of the World (BFW) for 2015. After being announced the winner of the Mexico version on November 24, 2015, he went on to represent the Mexican franchise at the world final, which was held in Florence, Italy on December 5. In recent years, franchising has become increasingly important, and Best Franchisee of the World is an international event that acknowledges franchisees— the entrepreneurs who demonstrate professionalism and attention toward the franchisor’s values and goals. Prior to the global event, a selection process was carried out in each participating country, where national versions of the event were held. Both the national and global events recognize the best franchisees of the leading franchise companies for their dedicated efforts and contributions to enhancing the brand. The competition also rewards franchisees who express teamwork, innovation and character leadership. Through participating in the competition, franchisees are able to increase the visibility of their franchise, as well as establish relationships with other franchising companies. At the 2015 national competition in Mexico, Omar Yunes was named the winner as a Sushi Itto franchisee, with the case “The Professionalization of the Role of the Franchisee,” while Ivan Tamer of Prendamex was named the second place winner, with the case “Implementation of Alternative System for the Control and Sale of Items”. This was the first edition of the Best Franchisee of the World in Mexico, which involved a total of 34 franchisees from across the country. Prior to announcing a winner, eight finalists were chosen. This year’s BFW will be held in Florence, Italy on December 3, 2016. Visit the official website for more information.